I absolutely love the opportunity to step outside of the norm, so I was very excited when Mark and Nikki asked me to perform their outside wedding last weekend. We are fortunate here in Maine to have seasons which change the look and feel of the landscape every few months. Why shouldn’t we take advantage of that? I also appreciate winter fashion, and it was refreshing to see a bride dressed in a white coat and boots instead of a white dress and heels. So New England, so winter, so casually classy! The weather stations predicted a “dusting” of snow for that morning. Of course, anyone who has spent a winter or two in Maine knows that a “dusting” isn’t always as innocent as it sounds. In a perfect world, a dusting would drop just enough fresh snow to cover the old, with no accumulation on the roadways. In which case, Mark and Nikki would be able to count on a spectacular backdrop for wedding photos. Lo and behold, we were given precisely the dusting I had hoped for Nikki and Mark. Mother Nature also raised the temperature to an enjoyable thirty-something. Now, thirty-something may seem cold to some, but in my opinion, it’s perfect. With temps in the thirties, you have rosy cheeks without shivering, and nature in its purest form (and the lack of black flies? BIG bonus!!!!!). It’s the best of both worlds, truly. 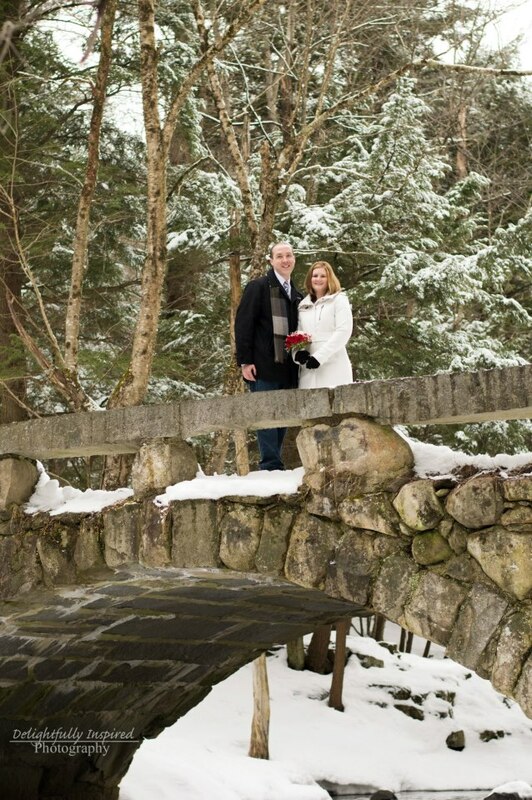 So, the wedding was to take place in Hallowell at Vaughan Woods (or Hobbit Land as the locals know it) on the bridge below the falls of Cascade Pond and over Vaughan Brook. I could attempt to describe what a gorgeous place this is, but the photos do it far more justice. I should mention that Mark and Nikki arranged this ceremony quietly and kept their plans a secret from all but their closest family which turned out to include ten people. And what a fun ten they were! The group met at the trailhead and made the short trek along the path to the bridge. 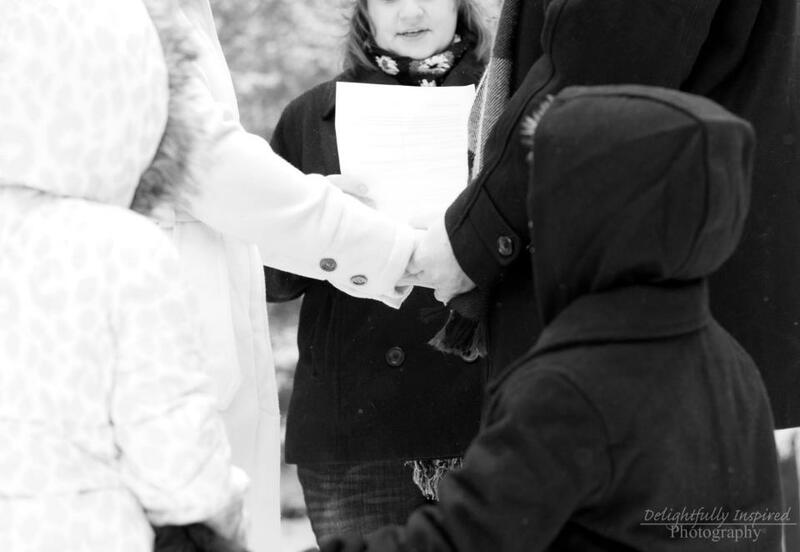 Mark and Nikki took the liberty not only to write their own vows, but their entire ceremony. The opening words were wonderful and I can’t help but share them below. The plan to marry is a tough secret to keep and so immediately following the ceremony, there was a bit of buzz about revealing to extended family and friends that the knot had been tied. On the walk out of the woods, we noticed a tree to the right of the trail with a large red heart painted on it. Because it was facing the opposite direction on the way in, we all missed it. But on the way out, there it was, blatant and obviously calling for Mark and Nikki to stand alongside it for photos. The day was filled with much love, laughter, excitement and playfulness. You just can’t ask for more. 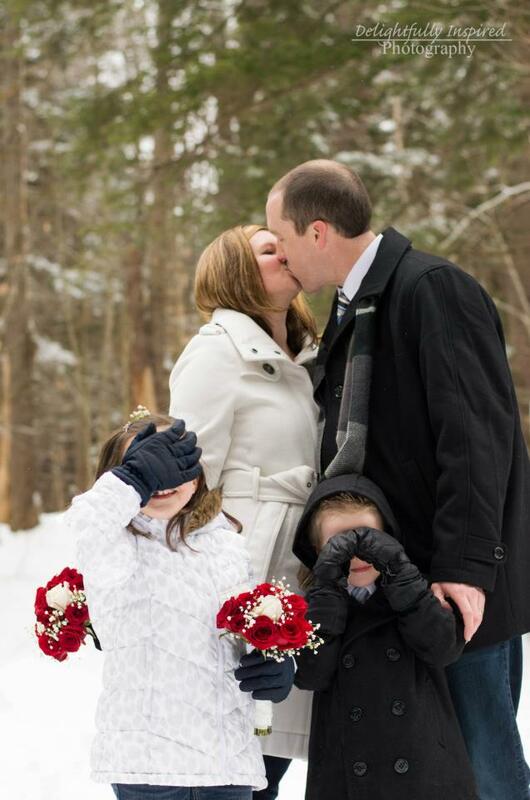 Congratulations and best of luck to Mark and Nikki. May you enjoy many more tomorrows. Jessica Parker at Delightfully Inspired Photography in Portland takes credit for these wonderful photos.